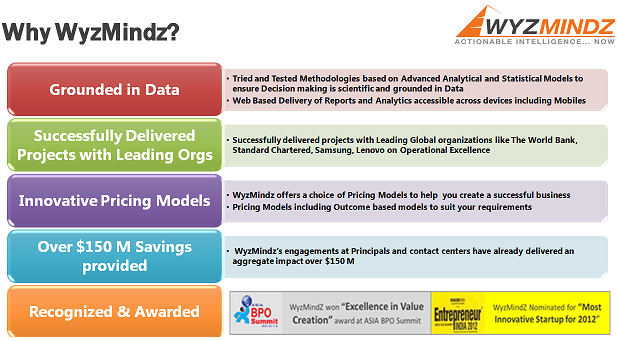 WyzMindz is pioneer in managed services solutions in India offering services in the field of Workforce management, Quality, Business Intelligence & Risk Analytics. Our consulting experience provides practical, cost effective innovative change, insights & knowledge to help you organize and maintain an effective, optimal model for your business growth and flexibility. We traverse the whole journey of process re-engineering & business optimization along with our clients. Our engagement methodology, core expertise, innovative pricing models pitch us in a strong position of being preferred partners for managed services solutions across various industry verticals. Our engagement methodology is deeply rooted in first understanding our client’s current business environment & then proposing best suited solution for the client. Based on facts & data we help organizations in travelling the business evolutionary journey of metricizing, Visualizing, Analyzing and Optimizing. Flexible engagement models ranging from Long term Managed services model to Build-Operate-Upgrade-transfer to Project based models provides multiple options for customer to decide the engagement type. What is Non-core but business essential for our clients is Core Competency of our delivery team. We take pride in having a team of professionals from across industry verticals with strong expertise & experience of their respective domains. We boost human resource that has helped multinationals achieve quality certifications like COPC, Six Sigma, ISO among other. Our domain expertise is further powered by proprietary tools in the field of business intelligence & analytics that helps us serve with cutting edge analytical capabilities across industry verticals. In a short span of time our work has brought us recognition & accolades both from our clients as well as from industry forums. In 2012 we were nominated as the most innovative startup by Entrepreneur India. In 2013 Asia BPO summit awarded us for excellence in Value creation. Our innovative pricing model has helped SME & MSME sector companies to engage with third party Managed service providers like us on project basis with ROI guarantee clause. “Skin in the game” approach of WyzmindZ brought receptiveness form SME & MSME sector to invest in business optimization projects.